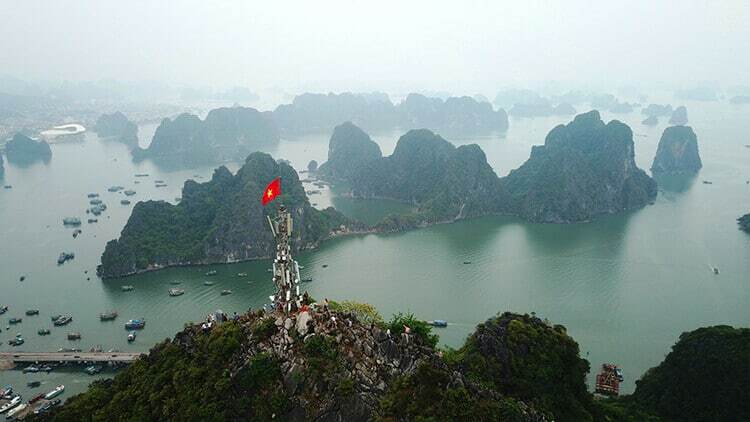 Bai Tho mountain (núi Bài Thơ) is one of Ha Long’s highest mountains, located at an altitude of 200 meters with half lying on the mainland, half lying on the sea. Bai Tho is a limestone mountain, which is originally called Truyen Dang mountain (núi Truyền Đăng) because this is the place where soldiers in the old days often set fire to alert the citadel every time there was an enemy (“truyen dang” in Sino-Vietnamese means “giving light”). Nowadays, people often call the mountain as Bai Tho due to the existence of 9 poems carved on the cliff, including Chinese characters by Le Thanh Tong in 1468 and Trinh Cuong in 1729. Each poem is invaluable, which remains almost intact until today and has become the pride of Ha Long city (thành phố Hạ Long). I. How To Get To Bai Tho Mountain? Ha Long is 160 kilometers far from Ha Noi, and possible transport means are motorbike/car or coach. For those who want to drive themselves, Google maps is certainly a best friend. The most straightforward route is to follow National Highway 1A (Quốc lộ 1A) from Ha Noi, through Ha Noi – Hai Phong Highway/QL5B (Cao tốc Hà Nội – Hải Phòng) and Noi Bai – Ha Long Highway/QL18 (Cao tốc Nội Bài – Hạ Long). People who do not have personal vehicles or prefer to relax can catch a coach at My Dinh station (bến xe Mỹ Đình), the first trip departs at 6:00 am and the last at 17:00 pm. Fares range from 100.000 VND/person for seat ticket to 200.000 VND/person for sleeper ticket. From the center of Ha Long, a bunch of choices is there for you, like continue with self-driving, catch a taxi straight to the foot of the mountain if traveling with a large group, or rent a motorbike at various cheap rental spots available all around the city. There are two ways for you to start your climbing journey. The first is along the path next to the house number 104A on Le Thanh Tong street (đường Lê Thánh Tông), and the second is through the path beside Long Tien pagoda (chùa Long Tiên) on Long Tien street. The mountain road of Bai Tho is made from concrete and quite easy to go, but the higher the road, the more dangerous it is with many broken staircases, requiring visitors to cling to steep limestone slabs to continue climbing. It takes 20 to 30 minutes to climb up depending on the number of people being together at a time, and 15 minutes to go down. The best time to climb Bai Tho mountain is around 4:30 am and 16:00 pm to enjoy gorgeous moments at dawn and sunset. However, you can choose to climb the mountain at any time of the day, the scenery viewed from the top is still very fascinated. After reaching the top of the mountain, you will admire the modern beauty of Ha Long city, as well as the colorful picture of Ha Long Bay (Vịnh Hạ Long) with lots of boats and islands of all shapes and sizes. You will take in your sight Bai Chay bridge (cầu Bãi Cháy), Cai Lan port (cảng Cái Lân), Co Tien mountain (núi Cô Tiên), and the bustle of the city. If you are lucky, you can also meet the lovely mountain goats grazed here. Climbing Bai Tho mountain, you will get the feeling of conquest. It is not just a sense of victory over yourself but also a satisfaction of winning nature. 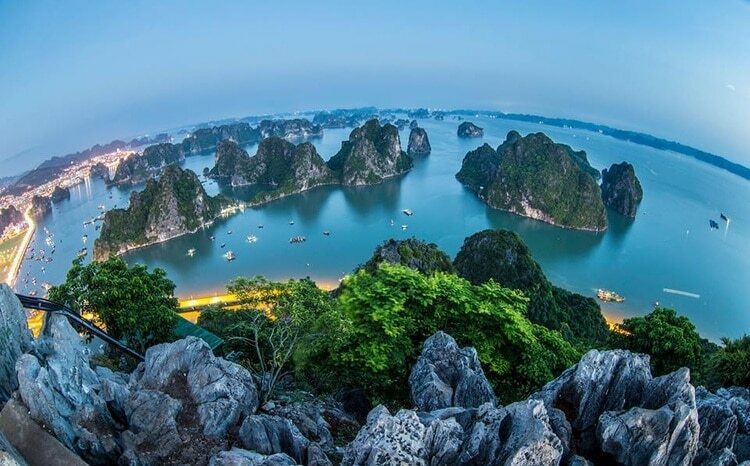 This will be an interesting experience for you on your journey to discover Ha Long because when referring to Ha Long – Quang Ninh, people will immediately think of beautiful beaches without imaging that Ha Long has such an attractive location. IV. Where To Stay In Ha Long? Below is the introduction to some hotels and homestays in Ha Long, which to consider based on your budget and plan. It is not too much to say that this is the most opulent hotel in Ha Long with a prime location, high-class interior design, and exceptional services. Wyndham Legend claims the international five-star standard, provides outdoor pools, European – Asian restaurants, bars, club lounge, fitness center, airport shuttle, ATM machines, and currency exchange. The hotel is only a few minutes walk from Sun World Ha Long Complex, Ha Long night market, and not too far from Ha Long Vincom Mall and Quang Ninh museum. Muong Thanh Luxury Quang Ninh is also situated in an affordable location which allows tourists to view Ha Long panoramically. The hotel possesses a swimming pool, tennis court, fitness and spa center, restaurants, lobby lounge and bar, and fully equipped rooms. For local sightseeing options, Bai Chay beach, Bai Chay bridge, Bai Chay tourist wharf, and Typhoon Water Park Ha Long are worth mentioning. Located next to Bai Chay beach and Sun World Ha Long Complex, Novotel Ha Long Bay offers the comfort and pleasing service for every visitor. Each room in the hotel is designed for the purpose of bringing the most comfortable lifestyle. With large windows, guests can enjoy a wide view of Halong Bay from above. Like other hotels at the same class, Novotel Ha Long Bay comes up with swimming pools, spa center, restaurants and bar, meeting halls, and airport shuttle. Amazing Ha Long homestay is right in the center of the city, which makes it convenient in traveling and shopping. The homestay has an apartment style, which is suitable for both large group and individual guests. 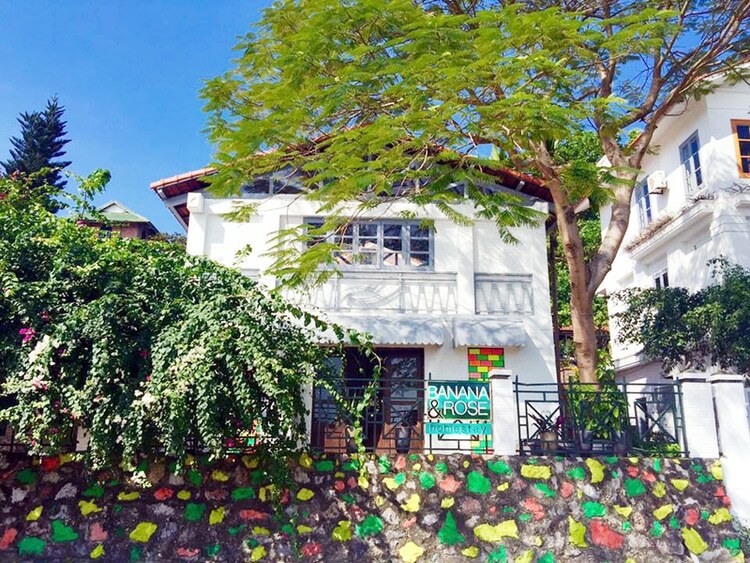 According to the owners, the standard capacity of the homestay is 6 people, and you will have to pay an extra fee for a maximum of 4 added people. Banana And Rose deserves to be one of the top choices when finding accommodation in Ha Long. It spreads over an area of 300 square meters, including the main house, garden, and swimming pool. The homestay has 6 rooms, of which the largest one accommodates 6 people, and the remaining are for 2. Guests who have stayed here highly appreciated the enthusiasm of the owners who are willing to guide them to make Vietnamese dishes. This is also an apartment homestay on Hoang Quoc Viet street, belongs to the famous Momento chain in Ha Noi. Come into operation recently, Momento Ha Long has 3 independent rooms and 2 bunks, serving about 10 guests at a time. In the summer, the homestay prioritizes groups and families; during other times, guests can rent a bed or a private room. Do not go on foggy days but choose sunny ones to make it easier in moving and to capture more adorable photos. You should wear trainers to avoid slippery mountain roads. Necessary things to bring: A hat if your trip is in the summer, a flashlight, water, snacks, garbage bags, and insect repellent. One important point to keep in mind is that mountain climbing is not appropriate for children under 10 years old. We hope this article has given you enough information for your adventure at Bai Tho mountain. Do not hesitate to leave a comment in the box below to question us or share with us the story about your vacation to Quang Ninh. To find more places to visit in Vietnam, please go to our Vina site.